Norman Rockwell (1894-1978), “Willie Gillis in Convoy,” c. 1943. Unused painting for “The Saturday Evening Post” cover, c. 1943. Private collection. ©Norman Rockwell Family Agency. All rights reserved. 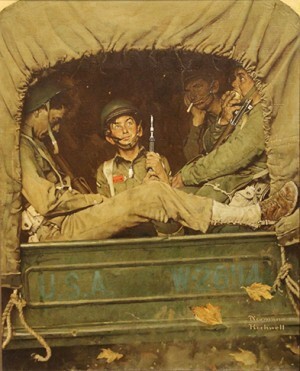 Distant from the activities of the war raging in Europe, Norman Rockwell (1894-1978) was challenged to record his interpretation of the effects of World War II on servicemen, and on Americans at home. For Rockwell, an unassuming fictional private named Willie Gillis told the story of one man’s army in a series of eleven published (and one unpublished) Saturday Evening Post covers, in which he was depicted doing everything from proudly receiving a care package from home to peeling potatoes and reading the hometown news. Rockwell met his Willie Gillis model, Robert Otis “Bob” Buck, at an Arlington, Vermont square dance. Then fifteen years of age, Buck was exempt from the draft, but anxious to enlist, he eventually began his service in 1943 as a naval aviator in the South Seas. The name Willis Gillis was coined by Rockwell’s wife, Mary Barstow Rockwell, an avid reader who drew inspiration from the story of Wee Gillis, a 1938 book about an orphan boy by Munro Leaf. 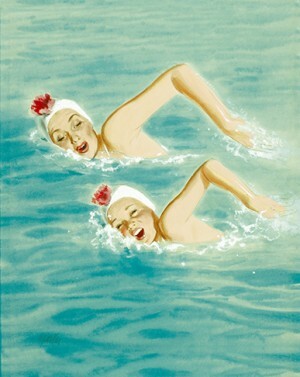 Al Parker (1906-1985), “Mother and Daughter Swimming,” 1940. Cover illustration for “Ladies’ Home Journal,” July 1940. Gouache on board. Collection of Kit and Donna Parker. When the first of illustrator Al Parker’s famed mother and daughter covers for Ladies’ Home Journal was published in February 1939, his graceful silhouettes gliding across the ice in perfect unison and in matching outfits created a sensation. Over the course of the next thirteen years, Parker’s fair-haired cover girls celebrated holiday traditions and shared a love of sport but also played their part during World War II. Resourceful and good-natured, they modeled best behavior by rationing, sending letters abroad, and taking on dad’s chores at home and in the garden. America’s ideal family was reunited in July 1945 when Parker’s mother and daughter welcomed their returning soldier, a powerful image that inspired another narrative at the outset of the baby-boomer generation. By that December, two knitted booties—one pink and one blue—were already underway, and in 1946, a son was born. 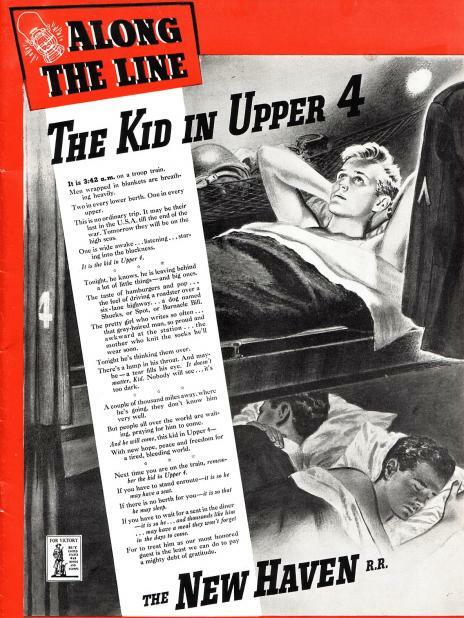 Created by copywriter Nelson Metcalf, Jr., “The Kid in Upper 4” was a World War II advertisement in American newspapers and magazines that purported to voice the thoughts of a lonely GI on his way to war. The ad and its sequels – which many advertising historians consider to be some of the most influential appeals of all time – allow scrutiny of the relationship between war-time depictions of soldiers and what some have termed “messianic militarism.” The Kid figure represented a twist on the existing trope of heroic soldier depictions in that it emphasized both identification and deification. Ultimately, the Kid’s episodic adventures were compelling because they presented readers with a comforting version of the sacred inevitability of an Allied victory. Saturday, February 28, 2015, 5:30 p.m. Discover the illustrated lives of print media characters who achieved popularity in the years surrounding World War II. James J Kimble, Ph.D will examine their narrative connections, and their impact on the American public during that era and beyond. Dr. James J. Kimble is a Rockwell Center Fellow and an Associate Professor at Seton Hall University in the Department of Communication and the Arts. Refreshments will be served. Free with Museum admission; program only $10; members free.